Not only is this a count by 10’s worksheet, its a count to 100 chart as well, all in a St Patrick’s Day theme. 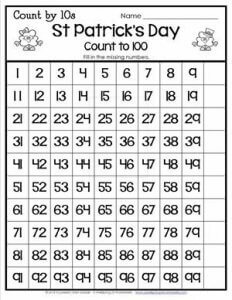 Kids can count one by one and fill in the missing numbers or they can go down the column and fill in the missing 10, 20, 30 and so on. After they fill in the worksheet they can count by 10s with a buddy and they can bring this page home and count by 1s and 10s to their parents.